When your roof has reached the end of its life expectancy, you need roofers who are capable of replacing your roof with a new, long lasting and durable roof. For trusted roofing contractors in Buckeye who are qualified to bring you the highest quality roofing services, contact the professionals at Arizona Roof Rescue. We can provide our customers with tile or shingle roof repair, roof replacement, and new roof installation for residents and business owners in Buckeye. With five star reviews on Google, Yelp, Angie’s List, and Home Advisor, finding trusted roofers in Buckeye is easy when you enlist the help of Arizona Roof Rescue. Affordable roof repair services by the expert roofing contractors at Arizona Roof Rescue. Buckeye is a small suburb in Maricopa County on the westernmost edge of the Phoenix metropolitan area. While it provides close access to the city and many of its amenities, Buckeye is also a small town with a population under 10,000, giving it the feeling of a tight knit community. 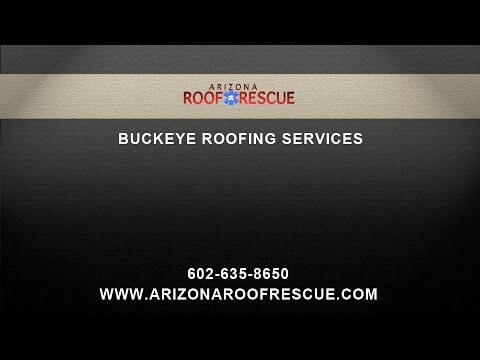 Arizona Roof Rescue has long been a part of the Buckeye family, providing emergency roof repair and maintenance, as well as installing new roofs. Our roofing company has a reputation in the community for quality workmanship and friendly service — which is saying something in a small town where word travels fast. If you need emergency roof repair, our team is there for you 24 hours a day, seven days a week. We want to make sure we stop leaks fast. Even if you have only a small leak, it can create a much bigger problem for your home if it is not stopped. Leaks can lead to mold, water damage and rot.Routine maintenance can help to stop roofing leaks before they begin.Our team provides annual and semi-annual inspections to identify any potential trouble spots and prevent leaks. Of course, if your roof is aging out, we can also help you to identify the best new roof option for your home, such as a shingle roof, tile roof, or foam roof. We offer a warranty on all our work, and our team is fully certified. When you are searching for roofers that can repair or replace your roof in Buckeye, trust the professionals at Arizona Roof Rescue. Licensed, bonded, and insured, we have been serving Buckeye and surrounding cities with over twenty years of roofing experience. Finding experienced roofing contractors in Buckeye is easy when you contact Arizona Roof Rescue. We can provide new roof installations for your shingle roofing or tile roofing, for any home or business in Buckeye. Proficient and professional, Arizona Roof Rescue can get the job done right. During monsoon season, your roof can take a large amount of the damage that the strong winds and rains inflict. That’s why we at Arizona Roof Rescue provide excellent quality roof repairs for your home or business, making sure that it remains protected and durable for years to come. Arizona Roof Rescue is A+ rated with the Better Business Bureau, and is locally owned by Alan Monzon. With over twenty years of roofing experience, you can trust the roofers at Arizona Roof Rescue to provide you with the highest quality and most trustworthy roofing services in Buckeye. With excellent customer service and client relations, our affordable roofing services and friendly roofers are sure to give you peace of mind when you need the roof or your home or business repaired or replaced. For free consultations, contact us today! I’ll Be A Return Customer! Find out why Arizona Roof Rescue is the roofing company that Buckeye homeowners and commercial property owners trust. Call Arizona Roof Rescue today for all your roof repair or maintenance needs, or consult with one of our professional and experienced roofers about the best choice for a new roof installation for your Buckeye, Arizona, home. We will ensure that you have a top quality roofing system that will protect your home, belongings, and family for years to come. At Arizona Roof Rescue, we know how important the state of your roof is, as it is there solely to protect your home or business structure from the elements. That’s why we take extra care to make sure your roof remains solid and durable so that no harm comes to your home. We provide quality, top rated tile roof replacements, shingle roof installations, and emergency roof repair for those times when you need it most. Serving the Buckeye areas of 85326, 85340, 85343, 85361, and 85396 as well as several neighborhoods such as Verrado, Arizona Roof Rescue has over 20 years of roofing experience and can provide you with a free roofing estimate! For more information about our roofers in Buckeye, contact us today!